I added a new 2016 server to our DFS. DFS Replication has replicated all files, however, when I connect to the share I don't see all the folders and files. I verified that I am connected to the local server from the client, but not all the files appear. Access based File Enumeration is turned off. How did you verify that DFS-R replicated "all" files? If some are missing, my first guess is that replication is nit yet complete. On the new server I browsed to the folder that contains the files. (Eg. E:\DfsShares\NamespaceFolder) to see all the files there. When I browse to the share from a client at the site with the new server, I don't see all the files and folders (Eg. \\domain.local\NamespaceFolder). Where, specifically, did you check ABE? Sorry, not sure what you mean by ABE. 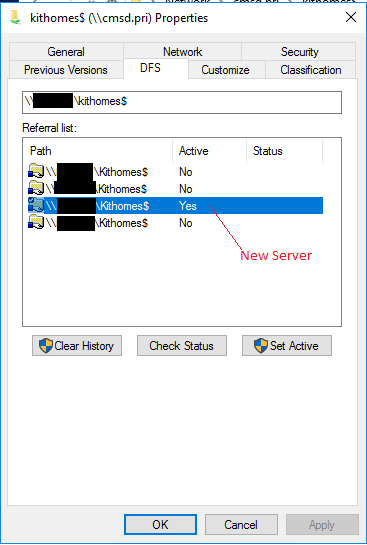 We have a namespace called Kithomes$ that is shared from E:\DfsRoots\Kithomes$ on 4 servers (including the new one). I have Dfs replication setup to replicate that E:\DfsRoots\Kithomes$ folder. When I go onto the new server and browse to E:\DfsRoots\Kithomes$ I see a folder named 1718. When I am on a client and browse to \\mydoman.local\Kithomes$ I don't see the folder 1718. On the client if I open the properties of the share I'm connected to and go to the DFS tab, I see that the new server is the DFS Server that the client is connected too. ABE. Access Based Enumeration. A mismatch in DFS causes very strange behavior. You should never set it on shares directly, and o ly enable or disable via DFS. I was asking where you disabled or checked it. I'd recommend enabling and re-disabling via DFS or ise DFSUtil just to be safe. I'd also be curious what happens if you bypass DFS-N and went to \\server\share$ directly from a client. That way you are using SMB, but not relying on DFS targets. One less step in the chain. Enabled and Disabled ABE using server manager for the share on the new server and also did the same in the DFS Management console on the namespace. Didn't seem to help. Accessing it by \\server\kithomes$ had the same results. I'm totally stumped by this. The existing servers are 2008 and the new server is 2016, if you think that makes a difference. All 4 servers replicated with one server at our HQ and it is 2012. Connecting to \\server\e$\DfsRoots\Kithomes$ will reveal all the files. So just straight SMB works fine. There is something about the DFS namespace that doesn't show all the files. "Enabled and Disabled ABE using server manager for the share on the new server "
That's exactly what you should NOT do. ONLY use DFS tools. At this point i'd remove the target. Remove the share. Then recreate the share then recreate the target. This *really* sounds like ABE gone awry and now the cache is screwed up. That's the fastest way to reset the cache. No dice. Going to remove and re-add the DFS Namespace role, which requires a reboot, so I'll have to schedule that. As a last resort you could try to enable / disable ABE via the DFS tools to see if it will correct any inconsistencies. I am not hopeful but work a shot. Sorry for the huge delay in response. After doing removing the DFS Namespace role and re-adding it later. It works. I don't know if the long delay before I was able to look at this issue had anything to do with it though.